Global climate change: Mother Nature or mankind? It’s always baffled me that an issue as important as our environment could become just another political pawn. There’s so much riding on whether or not humans are truly destroying the Earth that one would think politicians and the public would be able to come to a consensus. But no, now it’s just another he-said/she-said debate in the halls of Washington and around the dinner table… until you step into the lab. “There are natural climate cycles but the current CO2 increase is not part of it,” said Susanne Neuer, Senior Sustainability Scientist at ASU. “The Earth has gone though changes much hotter than we have today. There are traces in the geological record where there was no ice anywhere in the Polar Regions. If all land ice currently bound on the continent is melted, the sea level would be 70 meters higher, and there have been much larger changes in sea level than that,” said Neuer. In college-level Psychical Geography courses, students are presented with evidence that the Earth has undergone extensive heating and cooling cycles throughout the course of its history. According to temperature data, the period we’re living in now is “unusually warm” with record droughts and wildfires. This is partially due to the fact that the amount of CO2 in the atmosphere recently reached its highest point in at least one million years. If you look at the history of Earth’s CO2 levels on the graph below, you’ll see that the spike in CO2 over the last 150 years is very insubstantial when compared to previous concentrations of the gas. 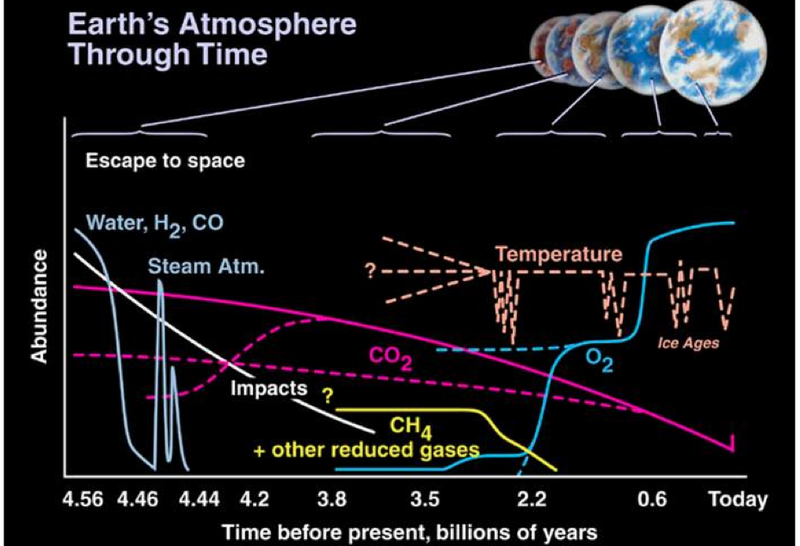 Components of Earth’s atmosphere over the last five billion years. Photo from a GPH 111 course at ASU. This is not to say that mankind is not affecting its atmosphere adversely, but rather there are far more factors to consider in climate change than just CO2. Yes, admittedly the last time CO2 levels in the atmosphere were this high, humans did not yet inhabit the planet. But the fact that we are still here proves it wasn’t the CO2 level that was making life for humans unsustainable at that time. Without wishing to get too deep into another subject matter, according to the Kardashev theory, Earth is currently a Type 0 civilization. This means we haven’t yet advanced far enough technologically to harness the power of all the weather events on our planet. Scientists predict human beings will be able to do so sometime early in the 22nd century. Until then, we must tread very carefully with the ecosystems of Earth, because they ultimately have more power over us than we do over them. According to Neuer, the ocean is taking up 90 percent of the planet’s heat and swallows up 30 percent of the CO2 released by fossil fuel burning into the atmosphere. In other words, it plays large and important role in our climate. Neuer cited her own research as evidence to support her claims. “In my own work I’ve seen surface-ocean warming and reduction of pH, which comes from CO2 being taken up by the ocean,” she said. “Reduction of pH, so-called ocean acidification, hurts sea life with carbonate shells or skeletons, such as corals. Neuer says it’s predicted in some model calculations that this disruption could come to a head in the next 200 years if we don’t get our act together. 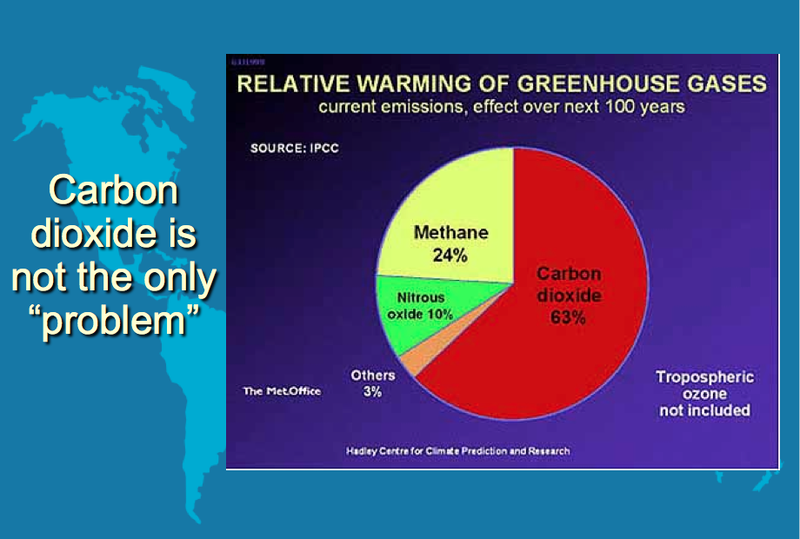 The graph shows the multiple elements in our atmosphere causing climate change. Photo from a GPH 111 course at ASU. Nancy Selover, State Climatologist for Arizona, took time to comment on the significance of record-breaking high and low temperatures so often reported on. Selover went on to explain that there are thermometers placed all over the globe to measure climate, including instruments on top of buoys to get a reading on temperatures over the oceans. But she says that there are areas of the globe that are either inaccessible or too inhospitable for humans to install temperature-scanning devices. Dr. Selover was also adamant about there not being enough done in terms of cleaning up the atmosphere, and that all the money and research seems to be going towards prevention. “If they said ‘Let’s stop burning fossil fuels and clean up the air to avoid respiratory issues’, it could be done in way less than 100 years,” she said. Selover says that removing CO2 from our air would have a more immediate impact than waiting for the CO2 to dissipate on its own. “You can’t just say ‘We need to stop putting CO2 up there.’ We also need to be cleaning it up,” she said. Happily, research professors have been working on CO2 removal methods very similar to what Dr. Selover described. The Center for Negative Carbon Emissions at ASU experiments with carbon-removal methods, which include algae growth and “capturing” carbon in rocks. Steve Atkins, Senior Engineer at the CNCE, has been working with his colleagues on technologies that remove carbon in different ways. According to Atkins, by feeding CO2 to algae they’re able to grow and eventually be converted into bio fuels. “Algae needs CO2 to grow better and faster. It’s how a lot of greenhouses pump elevated levels of CO2 into their structure,” he said. 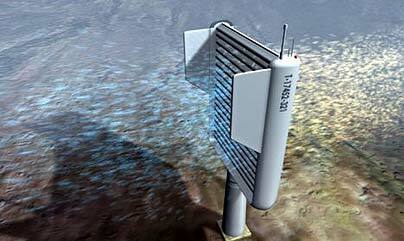 “The overall goal is to be able to capture CO2 from the atmosphere at a low cost,” said Atkins. “We’re aiming to do this at a cost that is below what everyone else can do. We’re looking at 100 dollars per ton of CO2 that’s captured.” Atkins says that a secondary goal is to demonstrate that the process is scalable and economically viable. “We need to demonstrate this technology at a commercial scale,” he said. The Center’s plan is to scale the project up to about one ton of CO2 removed from the air per day. But to do this they’d have to produce and deploy the devices that facilitate this process at the same rate that the U.S. produces automobiles. “We mass-produce so many other things in this country. We can do this too,” said Atkins. An artist’s impression of the CO2 ‘scrubber’ designed by Klaus Lackner. Photo from telegraph.co.uk. According to the Center, the impact on the environment will come with the mass production of this machine. “Worst-case scenario, we would need 100 million of these devices out there to reduce carbon levels,” said Atkins. That may sound like a lot of machines to build and have taking up space, but remember that there are 165 thousand cars produced around the world every day. The difference is, instead of producing carbon dioxide like cars do, these machines will actually consume it. Now for the million-dollar question: Will any of this save us? Or is it too late to make a change? But are we at least going in the right direction? Atkins doesn’t think so. He says he’s pessimistic about the political and financial side of this issue. According to climatologists’ calculations, in order to reach emission goals, 80 percent of the Earth’s oil has to stay in the ground. Atkins sees that as contrary to oil companies’ plans and financial interests. “We’ve made some progress in the fossil fuel industry but only a few coal plants have closed, and generally for financial, not environmental, reasons,” he said. A focused, unbiased take on global events.